When is it a bad time of year to go foraging……never! That’s right, it’s never a bad time of year for a basket or bucket full of free, delicious, healthy food. You just need to make sure you’re in the right place at the right time and as a good friend of mine says, there’s no such thing as bad weather, just inappropriate clothing. It’s January 2nd and it’s pretty cold outside but plenty of the Spring greens are already awake and excitedly putting up new shoots and tender edible leaves. My picture features fourteen of these that I picked in about as many minutes this morning and made into a tasty salad .Ok, the cold weather may lend itself more to a hearty soup or stew but the combined nutritional value and health giving properties of this lot will go toe to toe with any hot pot and the amazing array of wild flavours puts the tasteless lettuce and spinach on sale in the shops so far in the shade it may as well be winter all year long. Oops, time to stop ranting and get on with it. So, top row from the left. Yarrow : Tasty feathery leaves and a distinctive flavour, also good in teas and as a pot herb later in the season. Also a great “bitter ” herb encouraging good digestion, acting as a diuretic and helping to purify the blood. Cow parsley : AKA wild chervil, a sweet tasting herb that goes really well with potatoes. Numerous very poisonous lookalikes though so I would suggest staying clear of this and other members of the carrot family unless you really know your stuff. Wall lettuce : Closely related to dandelion but far less bitter, a really top class salad plant as is the very similar Sow Thistle. Both are very common most of the year round. Crow garlic : Actually this is probably domestic Chives as it was growing out of someones lawn but this is a foraging blog so lets stick with the wild name. Everyone knows how this tastes and all edible members of this family are vital for keeping colds at bay, lowering colesterol and helping the liver remove toxins from our bodies. Hooray for garlic! Hairy bittercress : Not really hairy or bitter, this is a lovely peppery member of the Cress family, great with eggs. It’s often found growing out of out door pot plants. Go on, check in your garden. Lesser celandine : Only eat a few leaves and before they flower otherwise it can become toxic, great tasting before though. Oxeye daisy : A really terrific and unusual tasting salad plant. I munch this all year round and the flowers are delicious too. Very small at this time of year though so a bit hard to ID unless your used to it. Goose grass : AKA sticky weed. In the same plant family as coffee, the top few inches of the young plants taste similar to Chickweed and are perfect for winter salads then as a cooked green later in the year. Broad leaved willow herb : Quite a new one for me. Most of the willow herbs are edible but you need to catch them at the right time of year. Rosebay willow herb is probably the most used. All parts of it are edible and in Russia they make Kapoor tea from it. Ribwort plantain : A robust and stringy plant later in the year. Right now it’s very good to eat and plentiful. Numerous medicinal uses too including stemming bleeding and drawing poisons from cuts and wounds. Primrose flowers : These definitely were not wild primrose so should probably be called Primula. The leaves we vile tasting, bitter and tough, unlike the beautiful subtle wild version. The flowers however were sweet and fragrant and great to add some colour. Nipplewort : Another member of the daisy family. I was surprised to find this so early. It tastes quite pleasant and has various unsubstantiated medicinal uses. Fennel : Wild or otherwise this is a terrific flavour. Not the big bulbed version on sale everywhere but the tall feathery, fruity and fragrant member of the carrot family. Great with fish…actually great with everything. This was just a very young shoot but easy to spot next to last years dead stalks with the umbrella shaped seed heads still in tact. Beware dangerous lookalikes. Wood avens : The roots of this plant taste of cloves and were popular for brewing and seasoning before the spice trade reached our shores. The leaves become too robust and too hairy but right now they are good to bulk up a salad. And that lot took just a few minutes to find. Another walk on another day will yield a totally different selection..also plentiful and very tasty at this time of year are young Mallow leaves, Chickweed, Ivy leaved toad flax(growing out of brick walls above the dog pee zone), possibly some early Ground ivy and Ground elder and Clover is always in abundance. All these salad items are readily available in the city and in the countryside but obviously it is vital to forage sensibly and safely, especially in urban environments. 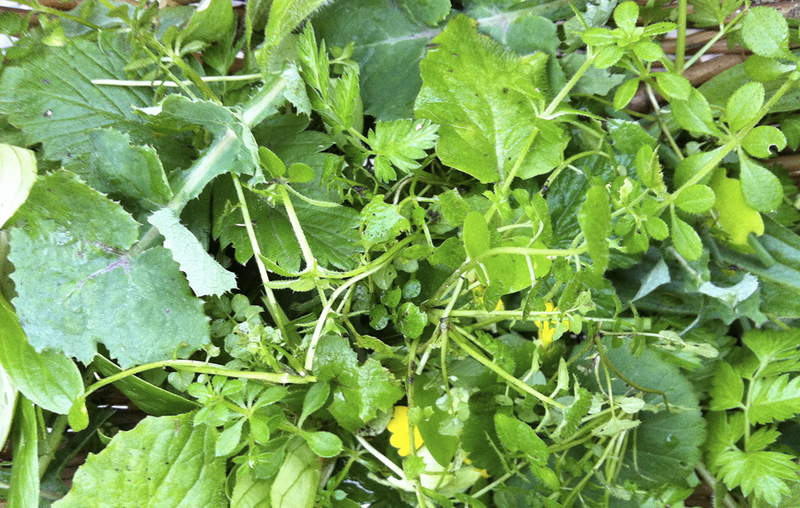 Check the Sensible foraging section on my website for more details. Also, remember that pretty much all these plants will be good as cooked vegetables as they become too tough to eat raw and many will produce other edible crops as the year goes on i.e. the seeds and roots. It may seem like nature is all tucked up in bed right now but there is masses to look at and to pick and it’s a great time of year to build some good observational skills that will stand you in good stead and provide bountiful foraging opportunities for the coming year. Happy new year. 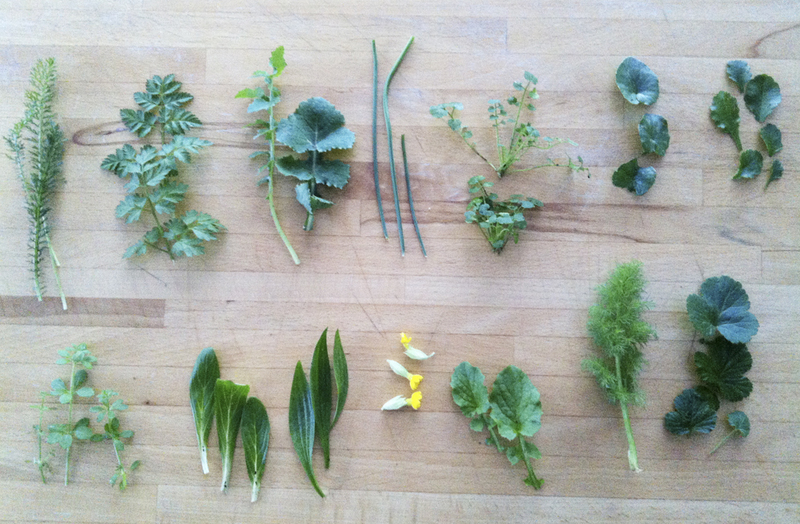 Next post: Foraging in the library (confession of a born again nerd).